You can’t always explain why two people come together – destiny, kismet, dumb luck. But whatever the reason, the outcome can be straight up magic. Our recent collaboration with badass apron maker Hedley & Bennett is proof of that magical connection. But before we get into how Ned Ludd became a member of the Apron Squad, we’ll tell you a story of our first fateful collaboration. 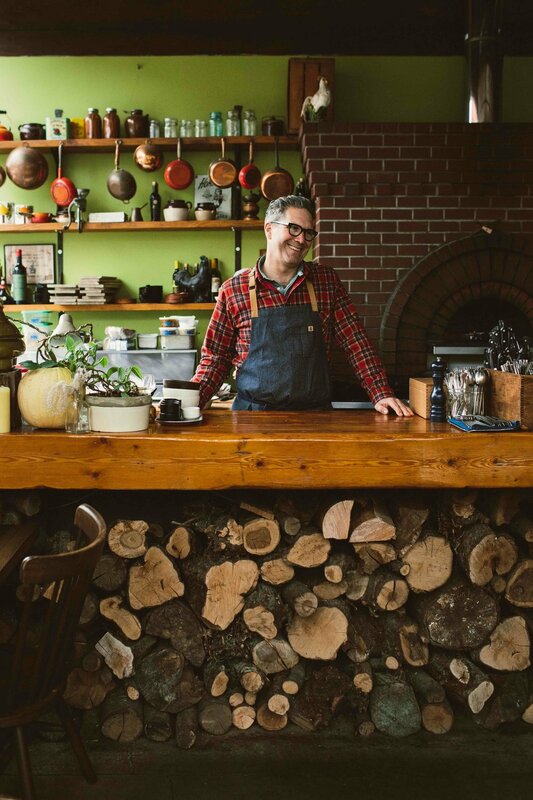 Ned Ludd Chef-Owner Jason French and creative mastermind Michelle Battista combined their talents personally and then professionally when they opened the gathering space, Elder Hall in 2014. Born out of their shared desire to create community through the pleasures of food and wine, the Hall has been a space for guests to gather, celebrate, and even learn something new while breaking bread around the table. Michelle spent years in design and brand consulting, but knew that food was where she belonged. Food was a new frontier she felt she just had to explore. Then she met Jason and this whole other world opened up for both of them. Jason soon realized he wanted to take his experience as a chef and grow into other creative ventures. “We wondered how should we take all of this magic – our strengths, our creativity – and really weave a fabric together to create something truly special for people to touch, smell, taste and experience,” explains Jason. It wasn’t easy, but their diligent focus on a shared vision allowed life, love and business fall into place. Michelle and Jason have been able to mesh their differing styles – she loves white, clean, unfussy minimalism while he loves color and old-fashioned rustic charm – into an aesthetic at Ned Ludd and Elder Hall, drawing inspiration from the hand crafted, clean, and highly functional design of the Shakers. Where Ned Ludd is festooned with nicknacks and relics of another time, Elder Hall evokes clean lines and minimalism, with just enough decor to transport patrons to a place and time of comfort and community. Our Hedley & Bennett apron is an extension of how the two approach design together – giving a nod to tradition while feeling thoroughly modern. Both share a love affair with stripes so it was only natural to choose a dark indigo railroad stripe pattern for the body. A navy blue strap ties the waist while gold pops the collar and the iconic HxB ampersand mark. The apron has all the functionality and durability to do the hard work of life in a restaurant and gathering hall, while the fabric, straps and pockets express a feeling of fun and individuality. We love Hedley & Bennett’s irreverent spirit and jumped at the chance to create something together when the opportunity came up. Michelle felt drawn to Ellen, aka The Apron Lady, just like she was drawn to the world of food. 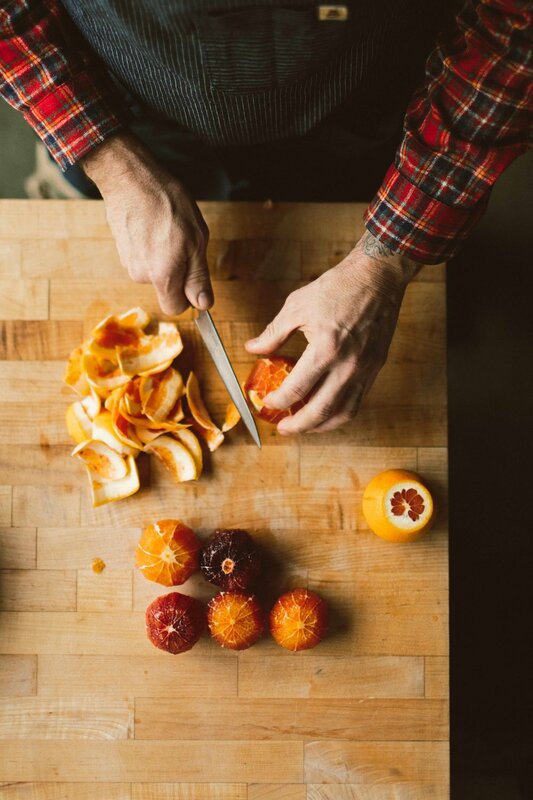 We loved what they cooked up together and feel proud to be a part of creative community that shares beauty, conviviality, and comfort in the kitchen and beyond. 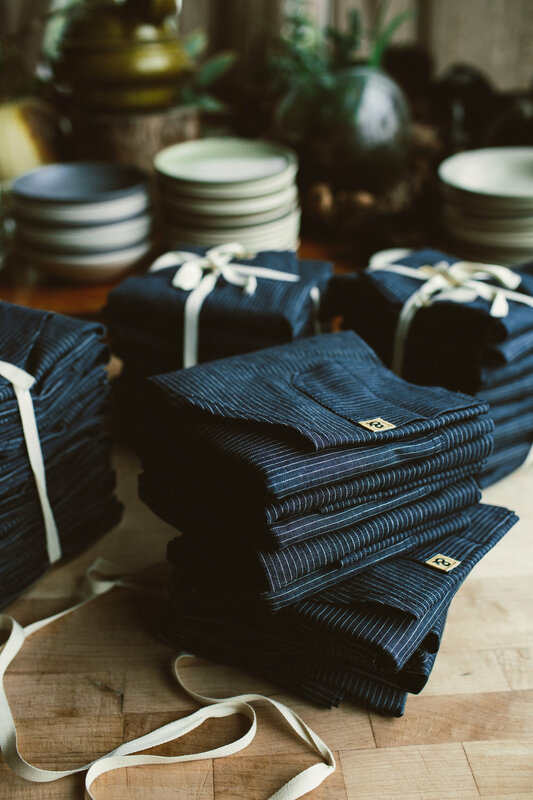 Get your own Ned Ludd apron HERE.